The cold weather doesn't discourage local youth from hitting the court outdoors this winter. 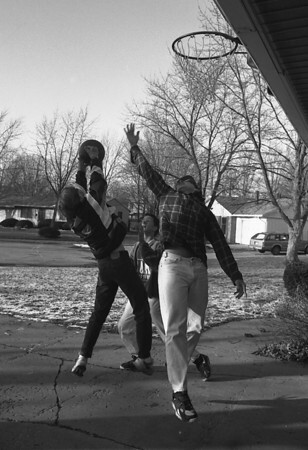 Shawn Sherman, at left, skies for the rebound over the outstretched hand of Christian Hill while his brother, Chuck Hill, rear, looks on. The youths were playing at a neighbors house at 402 James Place in Monday's chill. The high temperature was only 28 degrees.